The Pope’s visit to Kenya had all Kenyans excited. Slum area Kangemi was cleaned up as the Pope was going to visit it. The Pope’s message to Kenya couldn’t have come at a better time. In the past few years, the gap between the rich and poor has widened, corruption has reached a critical level and the non existence of basic services and infrastructure. It seems we live in a society where the people in charge of the Government have their heads buried in the sand, oblivious of what problems the rest of Kenya is facing. He spoke out against corruption, criticized the lack of roads, sewers, drinking water, electricity,refuse collection, schools, hospitals, proper housing and security for children. He talked of new colonialism taking place in Kenya, where the rich are depriving the poor of their basic rights to basic amenities.He urged the people of Kenya to value family traditions and more respect for women. More than 300,000 people turned up for the Holy Mass in spite of the heavy rains and cold.We can only hope that the Government will heed the Pope’s advise and bring about positive change for the people and country of Kenya. Coming to today’s post, for the November Shhh Cooking Secretly, my partner Nirmala Gurunathan of Nirmala’s Kitchen gave me millet and pepper as the two ingredients to work with. I had just bought a packet of Kodo millet (kodri, arikelu, harka, varagu,kodra). So when Nirmala suggested millet, I was excited. I remember my mother in law would make kodri as we call it in Gujarati, for my diabetic father in law instead of rice.The it disappeared from the market here till I saw it again in a small pack at Nakumatt. Easy to prepare and healthy, I made kodri pulao and served it with yogurt. It’s ideal as a light meal. Wash kodo millet under running water for a few seconds. Let it soak in the measured water for 15-20 minutes. Heat oil and ghee in a saucepan over medium heat. Add cinnamon, cloves, peppercorns. Add mustard seeds and cumin seeds. When the seeds begin to splutter, add the onion. Stir fry till it becomes soft. Add garlic and stir fry till its light pink in colour. Add the vegetables and salt and mix well. Finally add the kodo millet. Mix well and then add the water in which the millet was soaked. Lower the heat, cover the pan with a lid and let it cook till done. 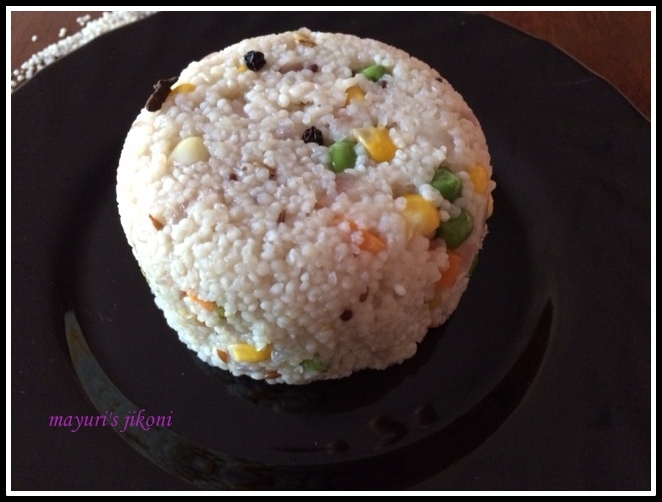 The kodri pulao will take about 15-18 minutes to cook. Serve with yogurt and your favourite pickle. Its best to chop/dice the vegetables about the same size as the corn or peas. You can make it without the onion and garlic if you want to. Add vegetables of your choice. I have never cooked with this ingredient.It sounds interesting and looks like bulgar wheat. I have never used kodri .. will try when I go to India. Nayna it can replace rice. Cooks quickly. As I mentioned, its a popular rice replacement for diabetics. long time ago kodri was usually used by the poor. Now its become a health food for many. Great website. A lot of useful info here. I am sending it to some friends ans also sharing in delicious.